HELL'S KITCHEN — A new campus of a lauded Upper West Side school began to be built in Hell's Kitchen with a ground breaking ceremony Monday. 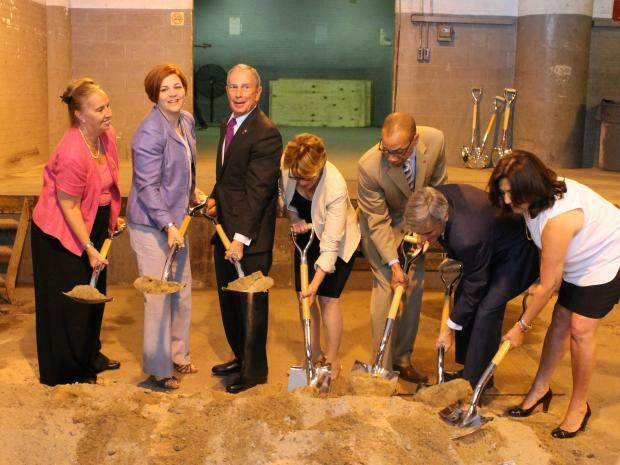 Mayor Michael Bloomberg broke ground for the Beacon School's new base, a project that will transform a 200,000 square foot, six-story former New York Public Library Annex into a modern high school. The School Construction Authority bought the building at 521 W. 43rd St. last year for $45 million. "It's going to be in an old building, but it's going to be a great new school," said Bloomberg. The larger campus will accommodate 1487 students and provide crucial facilities to the Beacon School, which is currently on West 61st Street. According to the mayor, enrollment at the current high school campus is 1,162 — crammed into a building designed for 827 students. "[The Beacon School] is so popular that it's very overcrowded," he said. "It tells you about New York City's school system that parents want their kids to go to school here in the city and kids want to stay here in the city." On top of added space — including 50 new classrooms and a 432-seat auditorium — the building will include new technology labs, wireless internet access, a black box theater and a 7,500 square foot gymnasium. The Beacon School was founded in 1993 with a goal of small class sizes. The school boasts a 99 percent graduation rate, with 82 percent of students going on to college. "This is a remarkable day for our students, who will learn about science while conducting experiments in a state-of-the-art new lab, and they will be introduced to various instruments and learn how to paint in new music and art classrooms," said Beacon High School Principal Ruth Lacey. One notable absence from the groundbreaking ceremony was Community Board 4 representatives, who had issues with the school moving to the neighborhood when the city approached them about it last year. According to CB4 chair Corey Johnson, no one from the board was invited. The board was originally upset that it only learned about the plan days before public comment on the proposal ended. Representatives eventually wrote a letter stating that they were pleased that the neighborhood would host such a well respected school, but had several concerns. The area is not close to public transportation, the board wrote, and the boom area around it is lacking in a standalone middle school, which it encouraged the SCA to build. But the mayor stood behind the plan to give the existing building over exclusively to Beacon School. The new Beacon School was designed by John Ciardullo & Associates and will be built by Skanska. It's set to open in 2015.